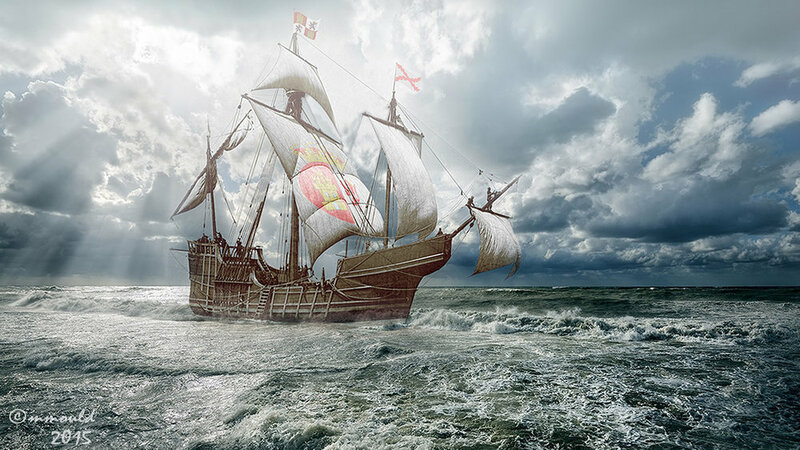 First Contact is a Tale about Juan Rodriguez Cabrillo, who first sailed into the waters of what is now the State of California in 1542 aboard his flagship, the San Salvador. He explored much of the coast, including The Channel islands. Cabrillo’s exploration of and interaction with the native peoples of present day California occurred 40 years before Christopher Columbus’ voyage of discovery and 168 years before the Pilgrims landed at Plymouth Rock. On September 28, 1542 after three months of sailing, Cabrillo brought his ships into a bay, which he called a “very good enclosed port.” He named it San Miguel, and claimed the land for Spain. Today it is San Diego Bay. Cabrillo’s was the first known landing of a European ship on the coast of Alta (Upper) California. His three ships then continued on up the coast of California, stopping at islands now called Santa Catalina and San Clemente, and passing the Santa Barbara Channel Islands. Along the way they saw and talked with many Indians. They noted the streams of smoke from Indian campfires along San Pedro and Santa Monica bays. They admired the plank canoes of the Chumash Indians near present-day Oxnard. Cabrillo always made friendly gestures toward the Indians and avoided any fighting. Forced back by strong winds at Point Conception, the ships anchored at one of the Channel Islands now called San Miguel. During the week they stayed there, Cabrillo apparently fell and broke his arm. However, as soon as the weather allowed, he continued on to the north. On November 16, 1542 the three ships anchored in Monterey Bay. They may well have gone further north, perhaps as far as Point Reyes, but they did not see the entrance to San Francisco Bay. The seas were very stormy and the ships were taking a hard beating. Cabrillo decided to turn south again and they reached San Miguel Island on November 23. He died on San Miguel Island on January 3, 1543. One story says that he slipped on a rock in December and shattered his shinbone. He then became very ill. Reports say that he was buried on San Miguel Island, but the site of his grave is not known. The Maritime Museum of San Diego, in partnership with Cabrillo National Monument, has built a full-sized, fully functional, and historically accurate replica of the San Salvador. The construction of the replica was based on historical and archeological research into early Spanish and Portuguese shipbuilding techniques. The construction was carried out in full public view on the shores of San Diego Bay by professional boat builders, assisted by scores of volunteers. Her keel was laid in April 2011; her first official public unveiling was in September 2015 when she led a parade of tall ships. Since then, interior work and rigging have continued at the Maritime Museum docks. San Salvador is currently open for dockside viewing only. When completed, she will remain home-ported in San Diego, but will also sail to other California coastal cities as an educational historical resource.